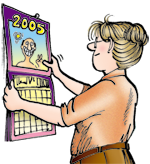 January | 2016 | FBorFW Strip Fix For Better or For Worse Comic Strip by Lynn Johnston. This entry was posted in Uncategorized on January 1, 2016 by stripfix. This entry was posted in Uncategorized on January 2, 2016 by stripfix. Lynn's Comments: My son, Aaron, really did stick his tongue to the school flagpole. A frantic teacher called me and I ran to the school in time to see one of the staff trying to pour hot coffee down the flagpole to warm it up. Another said to just pull him off, so I worked at his tongue, which was stretched like an elastic, and his teacher pulled him. With an "OUCH!" he was finally free. I thought he'd be upset, but Aaron was quite proud. When he'd stopped nursing his sore tongue, he happily pointed to the pole where a number of small, fuzzy spots marked battles with other frozen tongues. "Here's Cathy, and here's Bryan, and here's--" I guess it's a rite of passage: every kid has to see if the warning has merit--and every generation discovers that it does. This entry was posted in Uncategorized on January 3, 2016 by stripfix. Lynn's Comments: Since ours was a bit of a "blended family" I wanted to include the common concern: will my kid and our kid get along? This entry was posted in Uncategorized on January 4, 2016 by stripfix. Lynn's Comments: I wanted to give Lawrence a challenging situation, and therefore give me something challenging to write about. How was a young boy, accustomed to being in the care of one female adult, going to adjust to a father figure--plus two more adult females in his family? This entry was posted in Uncategorized on January 5, 2016 by stripfix. Lynn's Comments: I wanted to see this situation through Lawrence's eyes, to put myself in his position. A male child with a problem like this on his hands gave me an ample fantasy workout. Would I be able to write and draw a believable situation? Would a reader Lawrence's age accept the dialogue and the expressions as true to life, or would he say, "It's an adult pretending to know how a kid feels"? This entry was posted in Uncategorized on January 6, 2016 by stripfix. Lynn's Comments: Writing for Lawrence was much more difficult than writing for Connie. As a single mother, I had gone through the same situation. I had a strong sense of what she was going through. Coming up with light-hearted quips while dealing with a serious situation, saved this storyline from becoming maudlin and preachy. As in all great personal upheaval, a sense of humour is essential--the best tool in your survival pack! This entry was posted in Uncategorized on January 7, 2016 by stripfix. Lynn's Comments: You can say something serious if the punch line is light. This was my way of keeping the characters "cartoons," while covering a sensitive topic. This entry was posted in Uncategorized on January 8, 2016 by stripfix. Lynn's Comments: I've often thought I was part of a vast and complicated video game wherein the players directed my life in the craziest ways--giving me challenges I could never have imagined for myself. The players would deliver a score depending on the way I behaved under stress. Another challenging aspect to the game is that I won't know what the score is until I leave the planet. I just hope that the ultimate winner is me! This entry was posted in Uncategorized on January 9, 2016 by stripfix. Lynn's Comments: I went to visit Mike Peters (Mother Goose and Grimm) in Florida. He had a "NordicTrack" in his rec room and it was covered with coats and other clothing. I asked him if he ever used it and he said, "Of course!" and he pointed, theatrically to the elaborate clothes rack it had become. That was the inspiration for this strip. This entry was posted in Uncategorized on January 10, 2016 by stripfix. Lynn's Comments: This idea was given to me by a male friend. It was his observation that women's conversations were much more serious and meaningful than men's. What do you think? Was he right? This entry was posted in Uncategorized on January 11, 2016 by stripfix. Lynn's Comments: I was once part of a study in which single women were being asked what it was that attracted us to certain men. My answer was fairly complex, but when I asked the counselor what gave her the right vibes, she said, "he has to smell right." This entry was posted in Uncategorized on January 12, 2016 by stripfix. Lynn's Comments: We went through the terms stepdad, and stepfather. In the end, Aaron called Rod, "Dad." It worked for us. This entry was posted in Uncategorized on January 13, 2016 by stripfix. Lynn's Comments: Talking about a parent who is no longer a part of the family is really difficult. My first husband was never there for my son. Over the years this has all been resolved, but when Aaron was young, it was important to talk openly and honestly about what had happened without prejudice and without assigning blame. I used to wonder when I'd feel like a grown up. Handling this issue made me grow up fast. This entry was posted in Uncategorized on January 14, 2016 by stripfix. This entry was posted in Uncategorized on January 15, 2016 by stripfix. Lynn's Comments: This, again, was a real conversation with a real punch line! This entry was posted in Uncategorized on January 16, 2016 by stripfix. Lynn's Comments: I went to visit Farley Mowat not long after the movie "Never Cry Wolf" had been released. It was based on a book Farley had written about his experience in Canada's north where, as a naturalist, he lived with wolves to see if they truly were the menace man believes them to be. He lived the way they live. He ate what they ate. In one scene, he is eating raw, wild mice; one of the most memorable parts of the movie. When I asked Farley if he really DID eat mice, he smiled and said, "My dear, I'm a writer. If something didn't happen, it SHOULD have." This is the long way of telling you that what Elizabeth is doing in this Sunday strip never happened but it should have. Watching Katie open and pour a can of apple juice, I thought: If she'd made multiple openings, the scene might just have gone just like this. This entry was posted in Uncategorized on January 17, 2016 by stripfix. This entry was posted in Uncategorized on January 18, 2016 by stripfix. Lynn's Comments: I had no idea how hard it was for smokers to quit. My brother tried time and again and finally succeeded. It was a real triumph. This entry was posted in Uncategorized on January 19, 2016 by stripfix. This entry was posted in Uncategorized on January 20, 2016 by stripfix. Lynn's Comments: I think I am a militant anti smoker! This entry was posted in Uncategorized on January 21, 2016 by stripfix. This entry was posted in Uncategorized on January 22, 2016 by stripfix. Lynn's Comments: This is an actual quote from my brother, Alan. I was fortunate in that my family always seemed to provide me with great material. Going back to the "what attracts you to certain men" subject, I was not forthcoming in giving you my list. The first requirement would be, "a good sense of humour." This entry was posted in Uncategorized on January 23, 2016 by stripfix. Lynn's Comments: Strips like this allowed me to vent to the fullest: to really let my feelings out. It was great to write, wonderful to draw, and then joyfully sent to the syndicate. When it was finally released in the papers, I had a chance to feel good all over again! I knew that letters would come from moms all over the place telling me I was right on track. Yeah. The strip, sometimes based on fantasy, made real life easier for me. This entry was posted in Uncategorized on January 24, 2016 by stripfix. Lynn's Comments: There were several Mrs. Bairds who thought this lady was named for her. One was a friend of my father's. Another was a neighbour we had in North Vancouver. When I needed a name, this one popped up, and I have no idea where it came from! This entry was posted in Uncategorized on January 25, 2016 by stripfix. This entry was posted in Uncategorized on January 26, 2016 by stripfix. This entry was posted in Uncategorized on January 27, 2016 by stripfix. Lynn's Comments: It's strange to be reading this again and writing notes on the subject because this: I have just sold my big lakefront house and have purchased a small townhouse. I get to move in this spring! This entry was posted in Uncategorized on January 28, 2016 by stripfix. This entry was posted in Uncategorized on January 29, 2016 by stripfix. This entry was posted in Uncategorized on January 30, 2016 by stripfix. 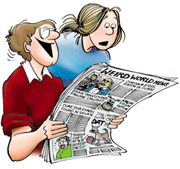 Lynn's Comments: Wordless strips were always fun. Making a story evident just by drawing a sequence of images kept me challenged and aware. The cartoonists who do this consistently have my admiration and applause. This entry was posted in Uncategorized on January 31, 2016 by stripfix.